As the result of a recent national shortage in paclitaxel, some patients who were receiving or scheduled to receive weekly paclitaxel were converted to every 3-week (q3w) docetaxel with granulocyte colony-stimulating factor support. Our institution noted higher than expected incidence of severe skin toxicity events attributable to docetaxel during the shortage period among our breast cancer patients. In this report, we summarize the clinical course of the first five cases, review the literature surrounding docetaxel-induced skin toxicity, and offer possible prevention and treatment strategies to improve docetaxel tolerability. The observation period for this case series was August 1 through October 21, 2011. All patients treated with docetaxel were identified from our electronic medical record. Operable stage I–III breast cancer patients who received ≥1 dose of docetaxel monotherapy at 75–100 mg/m2 q3w were included in this study. 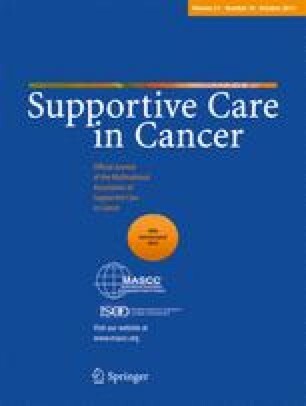 The cases of grade 3–4 docetaxel-induced skin toxicities identified by the treating oncologists were then contacted and signed an informed consent through an Institutional Review Board-approved protocol. Thirty-four patients met the inclusion criteria. Five patients (14.7 %) experienced grade 3 skin toxicity events attributable to docetaxel, a significantly higher rate than previously reported for docetaxel dosed at 75–100 mg/m2. Docetaxel-induced dermatologic toxicity is well characterized; nonetheless, its etiology is largely unknown and evidence-based prevention and management strategies are lacking. This report shows that the use of docetaxel 75–100 mg/m2 q3w subsequent to dose-dense doxorubicin and cyclophosphamide regimen can lead to unacceptable rate of severe skin toxicity. All other authors state that they have no conflict of interest, nothing to disclose.